This brand-new cycle of all Shostakovich’s symphonies is a must buy because of its outstanding performance, great interpretation, and magnificent recording. The Tatarstan National Symphony Orchestra and their music director Alexander Sladkovsky are largely unfamiliar on the international musical circuit; however, they have been touring to Western Europe making well reviewed visits to Germany and the Musikverein in Vienna in recent years. Melodiya have issued a box set of Mahler symphonies 1, 5 and 9 coupled with the vintage recordings by Kondrashin and the Moscow Philharmonic, and, a well-received set of all the Shostakovich concertos with outstanding young Russian soloists. Sladkovsky was educated in Moscow and St Petersburg and began working with orchestras in St Petersburg, before guest conducting with different Russian orchestras. He worked as an assistant to Mariss Jansons, and to Mstislav Rostropovich. The orchestra which is based in Kazan has a distinguished history particularly when they were under Nathan Rakhlin (1967-1979). Rakhlin, with the USSR SSO, gave the world premiere of Shostakovich’s Eleventh Symphony in 1957; other conductors in the Tatar orchestra’s history include Mark Paverman, Fuat Mansurov and Vladimir Ziva. Since he was appointed in 2010, Sladkovsky has created a top-class ensemble with some marvellously gifted musicians; significantly the orchestra were given Italian instruments as a gift by the President of Tatarstan. This new set of Shostakovich symphonies is notable because it is the first to be recorded by an orchestra outside the two main cities of Moscow and St Petersburg and the first Russian complete recordings since the cycle under Rozhdestvensky and the Ministry of Culture Symphony Orchestra. The latter was released by JVC in Japan, and in the UK by Olympia in the 1980s, and later by BMG Melodiya in the 1990s. This cycle may be difficult to get hold of; however, the remastered 2006 issue on CD by Melodiya under Kondrashin is available. I have compared the new set with Kondrashin’s cycle, with Mravinsky’s recordings, and the one by Dmitrij Kitajenko and the Gurzenich Orchestra Köln issued by Capriccio in 2005. There is an incomplete cycle by Gergiev and his Mariinsky Orchestra on the Mariinsky label, which currently lacks nos. 12, 13, and 14. The 2016 box from Melodiya, with different conductors and orchestras recorded between 1961 and 1984, is of historic importance. This new sturdy Melodiya box comes with two 26-page booklets, one in Russian, the other in English, with informative and well translated studies by Boris Mukosey, albeit without translations of the vocal works, and biographies on Sladkovsky, orchestra, choir and soloists. An admirable feature of this release are El Lisitsky’s paintings of the 1920s and 1930s period of Soviet art which decorate each cardboard sleeve, the most attractive I have seen from this company. 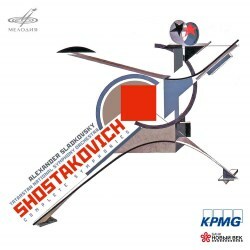 This release was sponsored by KPMG, and the Novy Vek bank, who supported previous release of the Shostakovich concertos. The ‘Leningrad’ symphony is on two CDs, and the Symphony No 3 takes up one CD. There are no fillers, like Kitajenko’s set, but Kondrashin’s has the Second Violin Concerto, the Execution of Stepan Razin, and two orchestral and choral pieces. One of the great assets of this new Melodiya set is that the Tatarstan musicians apply themselves to the early pieces as they would to the more celebrated of the composer’s works. It Clearly, the conductor’s respectful treatment has allowed him to make his own judgement on interpreting Shostakovich. One issue which makes this cycle very desirable, is the outstanding quality of the recordings. They are of a very high standard; the engineers have caught the acoustics admirably and in a manner which benefits this orchestra. The mike settings are close, but not overly so. Symphony No 1 is admirably performed and it becomes obvious the orchestra have magnificent woodwind - notably the clarinet of Arthur Mukhametshin and the flute of Venera Porfirieva – and an equally fine brass group led by Sergey Antonov. The sharp woodwind and brilliant intonation fully express Shostakovich’s penchant for irony and the grotesque; in the second movement, Sladkovsky adopts a quick pace: this is Shostakovich with a smile, and the piano playing of Edward Akhmatov is extraordinary. There is just a hint of the conductor’s voice at the end. In the third movement, we hear the admirable first violin of Nikolay Usanov, and the brilliant trumpet solo by Denis Petrov. The ensemble playing is excellent in the fast-paced finale, which comes to a great climax. Jansons has made three recordings, all of which are recommendable, and it is difficult to dismiss Kondrashin’s fine recording too. A common feature of Kitajenko’s traversal of the Shostakovich symphonies is the close miking and the high level of recording. Symphony No 2 is a remarkable recording; we hear the low strings invoking a gathering of the masses, then the developing theme is infectious, for the brass enter the fray with a solo from the trumpet; suddenly it explodes in quirky sounds, anticipating Ligeti and Penderecki forty years later, and soon we hear a factory horn, followed by the mixed chorus, then a repetition of the factory horn, all culminating in a superbly controlled climax. This recording is revelatory, because Sladkovsky treats the symphony as a work from the composer’s early pioneering years when he was influenced by the revolution; as such, it comes across as a genuinely thought-provoking, avant-garde symphony. Symphony No 3 is in a similar socialist-realist mode and its sincerity is fascinating. The opening clarinet threnody by Dmitry Zgonnik is soulful, the plucking strings create a tentative mood, and the woodwind are again stunning. The second idea on the brass is superbly played as if they really believe in this music, with the clarion calls from the brass and scurrying strings, and gorgeous strains from the trumpet, responding to the clarinet of Zgonnik. A beautiful graceful theme develops into a heroic one for woodwind and the brass races to a brilliantly mad climax as if for an execution, when a drum-roll relieves the tension. Sladkovsky’s treatment of these two early neglected symphonies is the surprise of this set and prepares one for the fine interpretations to come. The dramatic opening of Symphony No 4 makes it clear that there are outstanding virtuosi in this orchestra; the phrasing is excellent throughout, and there is a beautiful flute passage, again from Porfirieva, in the second movement. A marvellously sustained atmosphere of suspense and quietude is sustained through to the final bars. Powerful, assertive passages for the flutes and oboes, exhibiting masterly control of different emotions, then a fragmentary waltz section, are played by the musicians as if their lives depend on it. Time stands still; this is a quite marvellous performance. However, Kondrashin extracts all the stress and passion from this score, and while the Tatars play magnificently, there is simply less angst here than we hear from the Muscovites. By the time we come to Symphony No 5, Sladkovsky’s recordings are made at a marginally lower recording level than those by Kitajenko, allowing for easier listening on headphones. Despite the remastering of the Kondrashin cycle, these modern digital recordings made in Kazan are better, excelling in detail. With the momentous opening, followed by thoughtful and reflective playing, an idea of great beauty arrives, with superb playing by the solo flute of Porfirieva, balanced by the piano and the brass chorale. In the slickly played second movement, tempi are brisk and there is an almost perfect balance in the recording. A theme in the brass intones music from Benatzky’s The White Horse Inn, followed again by wonderful flute playing. In the slow movement, the conductor adopts a funereal pace. This is most sensitively controlled, the flute and clarinets share the probing theme, trailed by a plaintive cry from Ramil Safin’s bassoon. In the finale, Sladkovsky adopts a brisk tempo; the strings are triumphant and celebratory, then there is a slow build-up of momentum; harp, timpani, brass, woodwind join in with a clarion call from the brass and drums, the tension builds at a steady pace, and triumph is delivered by the timpani. General recommendations for this symphony may be the recordings by Ancerl on Supraphon and Maxim Shostakovich’s with the USSR SSO on Melodiya - and of course the three recordings by Mravinsky’s Leningraders. In Sladkovsky’s take on Symphony No 6, the opening allows for great expectation, with glorious playing from the trumpet of Denis Petrov, and again flute with the cor anglais in an almost heavenly section. In the second movement, there is some mercurial woodwind playing, with the high-flying flute of Porfirieva beautifully announced. In the finale, a merry dance in a brisk, joyful tempo, hints at Haydn and Rossini, with a hint of parody of Mozart’s Symphony No 40. Again, Mravinsky’s 1965 live recording is the main choice, despite the deficiencies in recording. To displace Svetlanov’s fine 1968 recording is difficult, but the Tatarstan musicians come close here; this Symphony No 7 has a slower tempo than Kondrashin or Kitajenkonand there is some beautiful oboe playing five minutes in from Andrew Shubin, just before the great march with the famous rhythm on the strings, quoting of Danilo’s song from Lehar’s Merry Widow. There is wonderful interplay between the woodwind, and piano, at 12 minutes; here, the great theme is at its height. At 19 minutes there is a solo for cor anglais from Nikitin, then the piano permits reality to intervene, the brass invokes a threat and the heroic woodwind theme increases in tempo, like a Wagnerian warning, providing a return to serene beauty, barely alive. In the second movement, we hear a gentle, leisurely theme on the clarinet of Mukhametshin’s clarinet, then an idyllic, romantic interlude for bassoon. The slow movement is performed magnificently, and the finale recalls the victory motif with which it began, akin to Beethoven’s Fifth Symphony, bringing this outstanding recording to a superb conclusion. Ancerl on Supraphon and Bernstein, in his second setting on DG, also made fine recordings. Kondrashin adopts a brisk pace throughout, and certainly emphasises the dramaturgical sense of the Seventh. In the second of the war trilogy symphonies, No 8, Sladkovsky adopts a marginally slower pace at the opening; with the arrival of the second theme at 5 minutes, there is a spine-chilling beauty in the almost funereal pace, allowing for a great building of tension at 13 minutes. Later at 17 minutes, the brass, woodwind deliver a great climax, after which the cor anglais is accompanied by fluttering strings; at 21 minutes, it settles down, and we return to the opening hesitant theme. The bright piccolo and woodwind interplay n the allegretto, then the cheeky tune on the woodwind is reprised and the strings return to normality providing a cessation to the preceding angst. In the spirited allegro, the strident toccata idea on low strings and the clarion call on Dmitry Trubakov’s trumpet are spectacular; the violins are immaculate in their intonations, the brass give warning shots, and the horns, the trumpet, tam-tam, and timpani all build to a terrible thunder clap which opens the Largo where we descend into despair, entering an icy landscape, almost immobile with the beauty of the horn play of Sergey Antonov. In the finale, with a bright idea on the flute, life reappears, with the build-up again through threatening chords from the violin of Maxim Manasypov, then the tension subsides with wonderful heavenly playing from the strings and finally there is peace. It is difficult to find a competitor to Mravinsky’s Eight, either in interpretation or starkness in musicality from the 1972 recording, though Kondrashin’s is still highly recommended. But this new version by Sladkovsky’s musicians is deservedly among the best. Kondrashin is superb in the last war symphony, yet in Sladkovsky’s Symphony No 9, the chirpy woodwinds, all in a mode of high spirits, are magnificent, and the trumpet solo is to die for! In the Largo, there is an exemplary brilliant brass section and wonderful bassoon playing from Safin. In the bright, and chirpy allegretto, there is tremendous build-up of excitement, like a circus parody, driven at great pace. Kitajenko’s musicians exhibit splendid musicianship, but to my mind they are just a bit behind in the Tatarstan handling of this mercurial piece, and marginally slower. In Sladkovsky’s take on the magisterial Symphony No 10 there is beautiful playing on strings, controlled in masterly fashion in a threatening atmosphere. The scherzo, with a hint of the Georgian folk song Suliko, is brilliant, stirring and tremendously exciting, not fearsome, driven at fantastic pace, with every department of the orchestra on top form. In the slow movement, the horn solo by Antonov invokes a Mahler song ‘Life and Death are Dark’, while the strings develop an episode of great tension, before the return to solo horn. In the finale, the we hear a mysterious uninviting mood, on the solitary cor anglais, and delivering of the Suliko idea challenging the monogram D.SCH, and a transition to the upbeat, optimistic finale. Karajan’s first recording on DG remains among the finest; Mravinsky’s, Kondrashin’s and Kitajenko’s performances are outstanding, too, but the Tatarstan musicians certainly present fine competition here. Now we approach two mature Shostakovich works influenced by ‘socialist-realism’. In Symphony No 11, the Tatarstan orchestra provide tremendously exciting playing, Sladkovsky directs his orchestra to evoke the mixture of events and the emotions narrated here, evincing noticeable influences from Mussorgsky. Kondrashin never seemed to take these ‘revolutionary’ symphonies seriously; he doesn’t allow the ‘protest songs’ to emerge from the score convincingly, racing over the music in his usual manner, certainly Kitajenko allows these themes to emerge fully, but Sladkovsky gives the better interpretation and quality of playing. Surprisingly, Mravinsky performed Symphony No 12 often, and his recordings are the best, perhaps matched only by Kitajenko. The strength of Sladkovsky’s recording of this work is the relentless momentum, with crystal clear woodwind articulation of the strident noble theme, ‘Brothers to the Sun’, a worker’s song, later allowing for bombastic brass, and some thrilling playing by strings. His treatment of the adagio, is almost like a liturgy, with beautiful playing from clarinet and bassoon, and an immaculate build-up of tempo. The clarity of the instrumental playing revealing indicates belief in this music, and the allegro theme of victory emerges sincerely. The tempo of Sladkovsky’s Symphony No 13, is slow; in the great opening movement ‘Baby Yar’, the Moscow-based Masters of Choral Singing are outstanding, the bass soloist is deeply inside this music, and the brass accompaniment is tremendous. Pyotr Migunov doesn’t have the grit of Gromadsky, but he is a fine actor/singer, in the mould of Nesterenko who is on the Kitajenko recording. Sladkovsky’s tempo is exactly right, with the obligatory wit in ‘Humour’, while in the ‘Careers’, the mood is serene, evocative, and very moving. Kondrashin gave the excellent world premiere but uses the second version of the text in his 1967 Melodiya recording (with the excellent Artur Eizen), whereas both Sladkovsky and Kitajenko use the original text which emphasises the anti-Semitism condemned in Yevtushenko’s poem. There is a recording of the 1962 premiere issued by the Moscow Conservatoire which would be a historical recommendation, but this is difficult obtain. The string playing in Symphony No 14 is beautifully articulated, the orchestral dynamics are striking and there are two great voices in the soloists, Migunov and Natalia Muradymova, who characterise the varied poems vividly throughout. This is a great performance, both in the solo singing of De Profundis and in the two duets accompanied by fine percussion, and there is a wonderful cello solo from Mikhail Grinchuk. To my mind this work is more influenced by Musorgsky than Mahler; there are so many different mood changes, from the deathly, to the melodramatic, exaltation, reflection, mockery and the atmosphere of the shocking Der Tod des Dichters. Based on this recording, it would appear that Muradymova, educated at the Urals State Conservatoire and the Stanislavsky Opera in Moscow, has great prospects. Her voice is as close to the great Vishnevskaya’s voice as I have heard; she certainly comes close to the ideal in this tortuous and difficult part and Migunov, too, has a wonderfully sensitive voice. The texts are all sung in Russian. Sladkovsky’s Symphony No 15 brings this outstanding cycle to a suitable culmination, showcasing his orchestra’s virtues with magical playing from the flute, xylophone and the trumpet. The ‘William Tell’ quotation is driven with great momentum and has real dramatic edge. In the adagio, there is some strikingly fine playing from funereal brass, solos from violin and cello intoning a plaintive melody, heart-rending, like the breathing of a dying man, while the allegretto marks a return to life. This is a cheeky parody, presenting Shostakovich as a joker, cocking a sardonic smile at life. We hear in turn Brünnhilde’s death motif from Die Walküre, the introduction on timpani, graceful music-making, then a building of tension to the terrible, fearful climax, then a reflective mood, the intonation of Wagner’s theme again, and a slow, burning out on the xylophone, as if a dying heart. To sum up: the Kondrashin cycle is of great importance and highly recommendable, notably so in the case of the Fifth, Sixth, Eighth, and Ninth. He has a penchant for taking a fast pace in order to bring out the drama of the music and this is not necessarily a weakness, but there is also the question of the standard of playing, with problems in the reeds and strings of Soviet orchestras in the sixties, albeit that the problems in recording have mostly been overcome through remastering. The Kitajenko cycle is excellently played throughout, although the recording is closely miked and several are from live concerts at the Köln Philharmonie, whilst others are from a local studio. Kitajenko’s timings are considerably longer in several symphonies: more than ten minutes in the Seventh, Eighth, and Tenth symphonies, while Sladkovsky is quite close to Kondrashin’s timing, usually only a few minutes behind. Briefly, Rozhdestvensky’s cycle with the Ministry of Culture SO, has an unnatural brilliance which is occasionally off-putting, and the standard of musicality is lower than that of other Russian orchestras. Jansons cycle for EMI employs different orchestras and is inconsistent and the Haitink cycle for Decca also features different orchestras, although the standard of playing and recording is excellent, but one wonders how much the musicians are ‘inside’ this music, as Haitink’s performances are like ‘orchestral showpieces’ without depth and gravitas - which is not the case with Sladkovsky’s cycle. One factor relevant in judging these different cycles, is that the Kondrashin cycle was performed by musicians who were living during the ‘Sturm und Drang’ of the Soviet era and the music was ‘inside them’, whilst that is not the case with the German musicians and neither is it with Sladkovsky’s musicians. Today’s musicians in Russia have different problems in their daily lives, more of economic uncertainty than of life and death; however, there is also the question of how Shostakovich’s symphonies lie in the purely musical sense. I think the great merit of this cycle by Sladkovsky and his musicians is that they perform them as classics, as musical masterpieces by one of the great 20th century composers. This new cycle can be judged all round as one of the best performed, best interpreted and best recorded available and can as such be highly recommended.